Network movie with William Holden and Peter Finch. Image: © A.M.P.A.S. The year when a boxing Cinderella punched his dim-witted way to a Best Picture Academy Award was the same year that offered a scathing anti-Cinderella, anti-dimwittedness satire. That was exactly thirty years ago. The punchbag flick was Rocky, the biting satire was Network. Directed by Sidney Lumet, fresh from his critical and commercial success Dog Day Afternoon, and written by Paddy Chayefsky, Network depicts a society comprised of psychos, morons, assholes, and TV watchers (comprised of psychos, morons, and assholes). Playing some of the denizens of this off-kilter world – truly, not unlike our own – are Peter Finch, Faye Dunaway, William Holden, Ned Beatty, and Robert Duvall. Does it sound too heavy? It isn't. Network is a social satire, after all, and a highly effective – and still highly relevant – one at that. If TV news (and gullible TV news watchers) were a source of concern back in the mid-1970s, now that U.S. newscasts are dominated by people who in a more civilized world would be strait-jacketed and shipped away to mental institutions, TV news have become much more worrisome. The panel discussion following a screening of Network on Aug. 28 at the Samuel Goldwyn Theater in Beverly Hills should yield some interesting insights about then vs. now. See more details below. Peter Finch, by the way, became the first – and thus far only – performer to win a posthumous Oscar. Press Release: Beverly Hills, CA – The 1976 Best Picture nominee Network will be screened as the final feature in part three of the Academy of Motion Picture Arts and Sciences' “Great To Be Nominated” series. The scathing satire of network television will be shown on Monday, August 28, at 7:30 p.m. in the Academy's Samuel Goldwyn Theater. Producer Howard Gottfried, cinematographer Owen Roizman, editor Alan Heim, production designer Philip Rosenberg, and cameramen Tom Priestley Jr. and Fred Schuler will participate in a panel discussion following the screening. 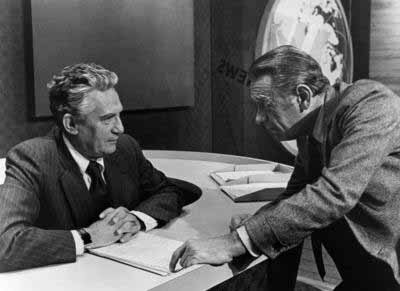 Oscar®-winner Peter Finch stars in Network as Howard Beale, an aging news anchor who threatens to commit suicide on-air after being fired by his network for poor ratings. His rant generates huge ratings, making him an asset to the network and altering his fate and the fate of his co-workers. The film won four Oscars, for Actor in a Leading Role (Finch, in his final performance), Actress in a Leading Role (Faye Dunaway as Diana Christensen), Actress in a Supporting Role (Beatrice Straight as Louise Schumacher) and Writing – Screenplay written directly for the screen based on factual material or on story material not previously published or produced (Paddy Chayefsky). The film also received nominations for Best Picture (Gottfried, producer), Actor in a Leading Role (William Holden as Max Schumacher), Actor in a Supporting Role (Ned Beatty as Arthur Jensen), Cinematography (Roizman), Directing (Sidney Lumet) and Film Editing (Heim). The Oscar-nominated live action short Number One (live action) will be screened prior to the feature, and its director, Dyan Cannon, will be present. Tickets for Network may be purchased at a cost of $5 for the general public and $3 for Academy members and students with a valid ID. Tickets may be purchased by mail, in person at the Academy during regular business hours or, depending on availability, on the night of the screening when the doors open at 6:30 p.m. Curtain time for the feature is 7:30 p.m., and pre-show elements will begin at 6:45 p.m. The Academy is located at 8949 Wilshire Boulevard in Beverly Hills. For more information, call (310) 247-3600.